Dare to wear 24HR shadow. Ink technology creates 24HR wear shadow for our most intense, long-lasting color saturation. Cream formula glides on without creasing and keeps color vibrant. Ophthalmologist-tested. Safe for sensitive eyes and contact lens wearers. Illuminate. With fingertips, sweep all over eye from inner corner and work outwards. For added drama, darken as desired. Maybelline Color Tattoos have gained quite a fan following since they were released a while back. These have been declared the affordable dupes for MAC Paint Pots, and while I haven't tried the MAC versions to vouch for that, I sure don't mind the "affordable" part :D I picked up the Maybelline Color Tattoo in Fierce and Tangy some time last year but really haven't used it much until now. Like all the other Color Tattoos, this too comes packaged in a glass pot with a screw-on lid. Assuming these are similar to gel liners, I always make sure that the lid is tightly on and I store them upside down to keep them from drying out. There is a lot of product in each pot, and I really don't think I would ever use up one to repurchase! Maybelline Color Tattoo in Fierce and Tangy is a toned-down orange with very fine shimmer mixed in. The shimmer doesn't really alter the texture or feel gritty but just adds a beautiful shine and subtle sparkle to the shadow. The color when applied like a swatch - heavily - is like a splash of orange and looks a bit too loud. Blended out, the color is a warm rust with very subtle shimmer. Here's a look at the swatches. I use the Maybelline Color Tattoo in Fierce and Tangy as an all-over shade and as a base for brown shadows. When blended out softly, the color neutralizes the darkness on my eyelids and brings a bit of warmth without looking ashy (which is my usual problem with anything that lightens). My usual eye look involves applying a soft wash of Fierce and Tangy from lashline to just above the crease and blended. Then, I smudge a bit of black/brown eyeliner along the upper lashline, kohl on my waterline and I am done. In the photo below, I have also used a hint of darker brown eyeshadow along the crease. 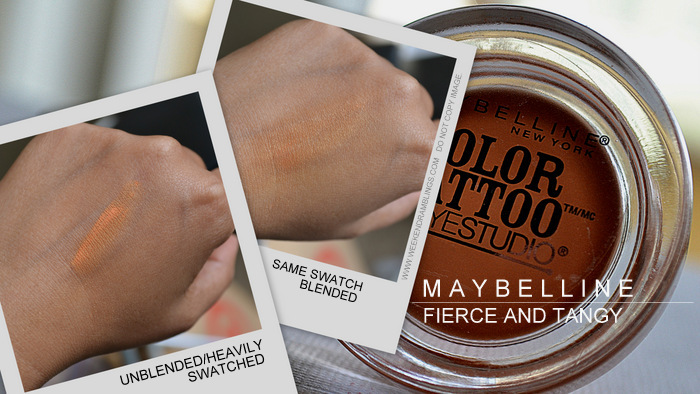 If you are darker skinned, like I am, Maybelline Color Tattoo in Fierce and Tangy is a must-have! I love how it adds a subtle warmth to my eyes and is a perfect base for brown (and khaki) shadows which on their own pretty much disappear on my darker eyelids. The color stays on the whole day, and I haven't had any issues with creasing so far. This would be my perfect eyeshadow base except for one small problem - I find the texture really dry. The good thing is this would be perfect for oily eyelids, but I would have preferred something that goes on smoother and less patchy. That apart, I would love to try out more colors from the Maybelline Color Tattoo range! Have you tried any shadows from the Maybelline Color Tattoo range? Any suggestions on a color I should try next?